Can $300 vibrating yoga pants improve your form? Billie Whitehouse is known for pushing boundaries with fashion and technology. Her company Wearable X designed Fundawear -- vibrating underwear for couples in long distance relationships that can be controlled by smartphones. It also created the Fan Jersey -- a shirt that uses haptic vibrations so sports fans can "feel" players' emotions during a game. But these were prototypes. Whitehouse's first product that's available for people to actually purchase is NadiX yoga pants. The pants have five sensors sewn in to help the wearer improve form for 30 different yoga poses. Once in a pose, the sensors vibrate in specific ways to tell you how to adjust your hips, knees or ankles. For downward dog, for instance, the pulses guide a person to ground the ankle and lift the knee. While Whitehouse is careful not to say that the pants help "correct" a yoga pose, they can sense if a person's pose is way out of whack. "The point of the product isn't to say there is a right and a wrong pose," said Whitehouse. "It isn't black and white. This is just about highlighting those micro muscles that you could be thinking about -- that you don't even know exist." Whitehouse says the pulses are intuitive, but overthinkers could find themselves questioning what the vibrations are trying to tell them. Unlike the majority of wearable fitness items out there, NadiX isn't intended to gather feedback about steps, calories or heart rate. That's representative of how Whitehouse and Ben Moir, cofounder and chief technology officer at Wearable X, view the projects they work on. "[Wearable tech] needs to take a backseat and let us live our lives," said Moir, who is based in Australia. He sees current wearable tech as largely in a "primitive" stage. He and Whitehouse, who is Australian but based in New York, want to create products that are less about quantifying the body and are more empathetic. The duo has been working for two years to bring NadiX to life. Whitehouse said that her board, and even Moir, originally told her that the idea would be impossible to execute. "Putting electronics into garments is still so new and so difficult," Moir said. "Yoga pants get stretched, get sweated in....the sensors had to be invisible, and the pants had to not be a tech-looking product. That's kind of an engineer's nightmare." It involved a lot of studying the anatomy, working closely with yoga instructors, and developing the right mix of materials -- from conductive wires typically used in bulletproof vests to the right chip for the sensors. But the pants come with a hefty price tag: $299. NadiX went on presale this month. The pants are slated to ship in August, and the team is also working on a top -- with three sensors -- to pair with it. The pants, which are manufactured in Sri Lanka, are machine washable and powered by a removable, rechargeable battery that lasts up to 90 minutes. 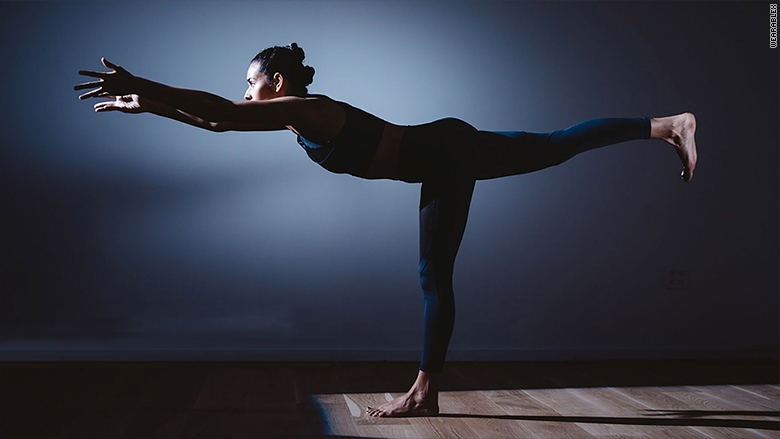 The battery connects via Bluetooth to a smartphone app, which lets people choose the level of yoga they're going to be practicing. Moir said they won't mine or store individualized data but will collect topline data like whether someone is a heavy user of NadiX or if their pants aren't working.